Remember that what you actually see will depend on your school’s settings. Course List – basically this is a list of of all your courses with information on level and maybe some comments from School Admin. Course Work – this is where you upload homework or pre-course work. Students can access this and download it when they log into their account. Course Work List – this is a list of all the course work you have uploaded for your classes. Course Syllabus List – If syllabuses have been uploaded for your courses then you will be able to view and download them from here. Lessons – All the lessons for your courses are here. If you are sharing a course with another teacher you will be able to view each others lesson comments. 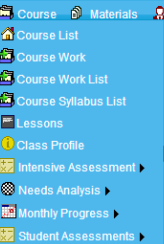 Final Items – the last 5 items in the menu: Class Profile, Intensive Assessment, Needs Analysis, Monthly Progress and Student Assessments are where reports which you completed via the dashboard are stored. You can find them here and see what you wrote for courses previously.